Read article about how control theory concepts are applied in many frameworks like Spring Security, JMX, JAAS on www.serverside.com! In this design a disturbance is measured by the sensor before it has an effect on the system. If in the above example it is known that opening a window will decrease the air temperature a sensor could measure the opening of the window and switch on the heater before the air temperature actually has gone down. 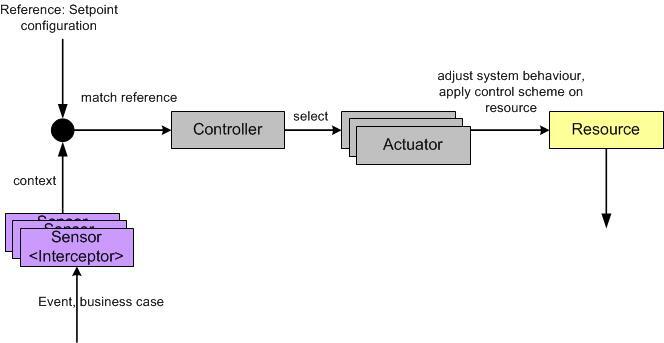 This is an example of a feed-forward controller: The controller acts before a disturbance affects the system. The difficulty with feed-forward controllers is that all possible disturbances and their influence on the system must be known, accounted for and observed by an appropriate sensor. If in the example the opening of the door is not observed the feed-forward controller will let the house cool down. Single-Input-Single-Output controllers (SISO) measure one system variable like air temperature in the above example of the house heating system. Multi-Input-Multi-Output controllers control more than one system variables. In real control systems often a synthesis of open and closed loop, feedback and feed-forward, SISO and MIMO controllers are used in sequential, hierarchical, nested or networked combination. In fact it is an open loop controller. An event is observed by a sensor which is appropriate to the controlled resource. The controller checks this signal, compares it with the configuration and actual context and decides which actions to take and which actuator to apply. The actions of the actuators are then an input to the resource.